Birding Is Fun! : Why Fledge New Birders? With the Pledge to Fledge (P2F) starting up tomorrow, I thought that it would be fun to write about the wonderful reasons to fledge new birders for my post this month. I think that all of us as birders, whether we have been birding for years or are relatively new, have a responsibility to try to introduce new people to birds. It doesn’t matter whether it’s your neighbors, non-birding friends, or a random individual that stops to chat while you are out birding. Any one of those people may be missing out on a love of birds that they are unaware they have. Why do I feel this is so important? To me, one of the most fundamental aspects of introducing new people to birding is the profound effect that these people can have on the birds. The more people that there are that understand both the beauty that birds bring to this world and the dangers that our birds face, the more support we will have when we try to address these issues. Our birds are always under some type of threat, and those threats are growing all the time. Recently in Indianapolis, we have had to fight against a local park’s proposal to create mountain biking trails through an area that will destroy prime nesting locations for many of our woodland birds. While we still do not know what the outcome will be, the amount of support that was generated by the birding community has hopefully helped to stop this trail from being created. While local birders did a fantastic job of coming together to fight this, what would have happened if two or three times as many birders lent their voice to this cause? I completely believe that the more people we can introduce to birding, no matter how casual their interest, the farther we can go toward accomplishing our conservation goals. Education is the key, and that is what P2F is all about. Not only will new birders have the ability to help spread the word about these issues, they will likely also support conservation initiatives with their money in some way or another. Let’s face it; we need more money for conservation. It seems that no “protected” lands are safe anymore. Hopefully with more conservation dollars, more critical bird habitats can be brought under the control of land trusts and other organizations that will protect them for years to come. While none of us actively fledge new birders for this specific reason, it’s a pretty awesome side effect! 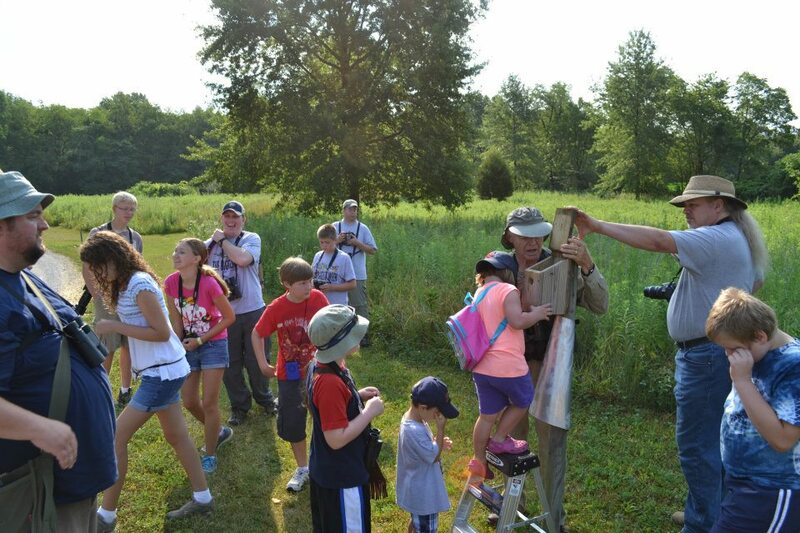 A group of young birders at an Indiana Young Birder's Club event. I also believe that these newly fledged birders are the future of birding. If we really want this hobby (and for some of us, this profession) to continue to grow, we must recruit new birders. You never know what the individual you took out birding yesterday might end up doing for birds and conservation in the future. This is especially true when working with kids and young adults. I think every birder should regularly take a child or teenager out birding. It’s good for you, it’s good for the kids, and it’s good for the birds. The young birders of today are the ornithologists and conservationists of tomorrow. I have introduced my in-laws to birding. and my wife and I pretty much lost them to everyone else. So what are you doing this weekend to help the P2F? Do you have a friend or neighbor that has expressed an interest in birds? Start off slow by just taking them out for an hour or two. Even if they don’t become birders, you will at least have shared your love of birds with them and helped them appreciate and be more aware of our feathered friends. Hi - will you post your Blog at The Birding Community ay vorts.com? Our members will love it! Connect with other Birders from around the world.